I returned from Michigan with a few days to spare before going to see my friend Deb in Colorado. We made our base in Breckenridge. I can tell I’m getting old! There is a huge difference in 8000 and 10,500 feet. We lived in Aspen for 6 years at 8000 feet and after a couple days I got used to the altitude. 10,500 feet and 30 years later is an entirely different animal. I huffed and puffed the entire week that we were in Breckenridge and when we went to Glenwood Springs and Aspen I really noticed the difference, I could breathe. We arrived in Breckenridge at the end of their International Festival of Arts but were able to take in a few of the events. Tree-O was pretty neat. We hiked part of the Illinois Creek Trail and found 3 musicians hanging from the trees playing music. We loved the troll created by Thomas Dambo who is an artist from Copenhagen, Denmark. 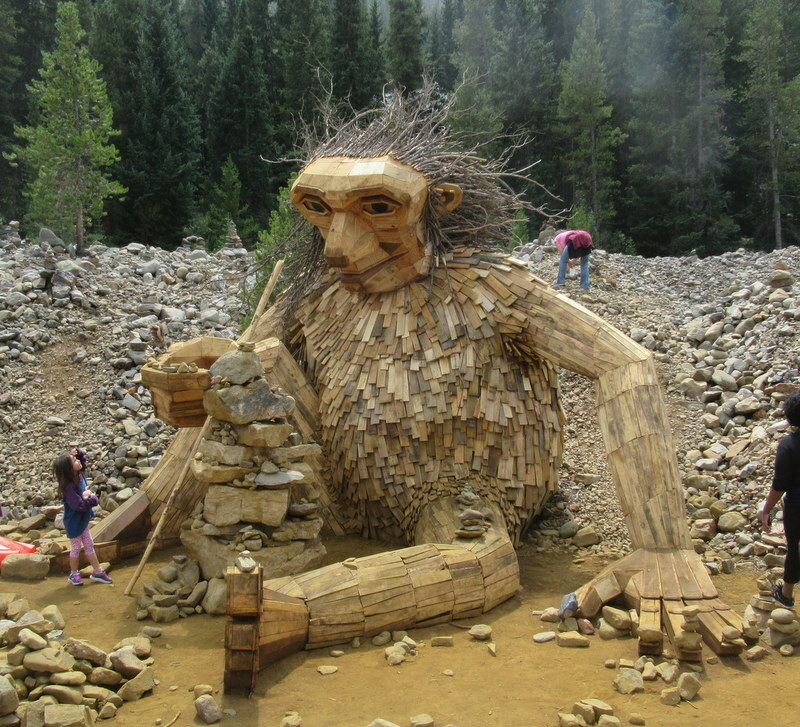 He made this huge troll out of wood on the spot. Again to see it we had to hike up one of the trails for about a quarter of a mile, it was worth the walk. We climbed over the big pile of stones to get to it, once over the top I slid and sat down. Since I’ve gotten older I haven’t been afraid to ask for help. I stuck my hand out and a young man helped me down the rest of the way. In the first photo you can get an idea how huge he was! probably 14 or 15 feet tall. you gotta get up – break away – I won’t know peace til I find my place – guess that’s part of the reason I’m traveling so much this year. Trying to figure out what is normal for me now without Michael and CC. For two entire days we soaked in hot springs, both in Glenwood Springs. First the one Michael and I always used to go to when we lived in Aspen….. He always used to say, can you image what it would have been like to ride the train from New York in 1888 and get off here to soak? Glenwood Hot Spring the worlds largest hot spring pool. The second hot springs day was spent at a new one called Iron Mountain Hot Springs, which is a totally different experience. There is a small pool but there are also a dozen or so hot tubs, each with a different temperature. It was very nice and was built only about 5 years ago. Frisco was a real surprise for me, I’ve probably driven by it dozens of times but never stopped, always in a hurry to get home or get to Denver. It’s a beautiful little town just outside of Breckenridge, with some really nice shops. I’ve always been interested in railroads, especially steam, something about the travel, the lore, the intricacy of the locomotives, the architecture of the depots, so was happy when Deb agreed to drive up Boreas Pass. Michael and I drove all of these old railroad beds we could but never made it up this one. This one over Boreas Pass was part of the Denver South Park and Pacific Railroad, which was built in 1882. The pass is at 11,481 feet, we made it to the top in a regular car. There were a few scary spots where you were driving on a cliff but all in all it was a pretty easy drive. We were surprised that people were camping along the way, some on a ledge. Usually camping isn’t allowed right along a road. The nice thing about driving on these old railroad beds is that they are never steep, just a gentle grade. The railroad shut down service over the Pass in 1937 and began taking up the rails. Another day we drove to Aspen, it continues to be one of my favorite places on earth. This is the road out of the back of the entrance to Buttermilk Mountain. The house we lived in was on the top of this ridge. Every day when we lived there we drove pass the road to the Maroon Bells. Not a bad sight! My old workplace the Aspen Times. After our week in the mountains we returned to Arvada, make several trips to Boulder then one to Longmont to the Benson Sculpture Park . I’d heard about this park and the sculpture Show held there every year but really had no idea of the extent of their collection. Very impressive! One of the sculptures is by Susan Pascal Beran – she did the Spider Lily Sculpture that sits in front of the Convention Center in our downtown. It was a great trip but now looking forward to some time at home…… little did I know Florence was on the horizon.